On September 12, 1952, there were 21 hours of sustained UFO activity occurring over the United States of America—an event not paralleled to this very day. Author Frank Feschino, Jr. has ferreted this out: the Nation's biggest ignored story, virtually alone, spending many years researching the aforementioned incident, traveling many thousands of miles on his quest to discover the truth about this forgotten series of events—our nations forgotten war with UFOs. God, but I know how that sounds... one must risk looking the fool sometimes to follow the evidentiary path, eh? Right or wrong, at least you had the tubes or sack to look. 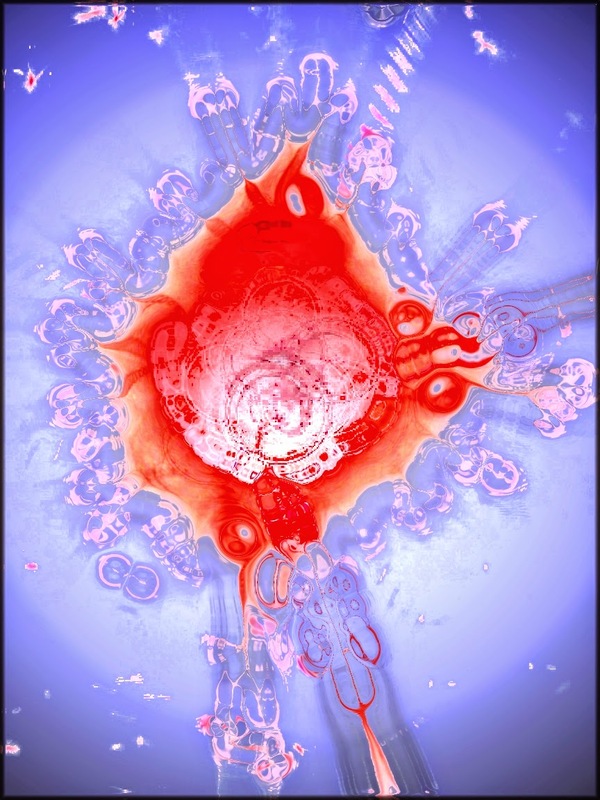 The story alluded to above is discovered in a hugely focused and intrepid research effort carried out over many years. Feschino is able to sequence the highly strange facts establishing a precise timeline of events for that dreadful day, a day which shocked countless Americans slack-jawed along the Eastern Seaboard, including the Nation's capitol. Multitudes are amazed and terrified as they watch numerous low-flying UFOs descend and crash-land on United States soil! It's all in Feschino's books. By gathering together several documented sources including (in order of usefulness) the official Project Blue Book, named news paper articles, and then first-hand witness testimonies, Feschino is able to establish that 25 different UFOs had flown over—or crashed—in 10 eastern states: Delaware, Maryland, North Carolina, Ohio, Pennsylvania, Tennessee, Virginia, Washington, D.C., West Virginia, and North Carolina. Four of the 25 objects had accounted for 13 crash landings in three states! These states are documented to be West Virginia, South Carolina and Tennessee. Additionally, there were 8 landing sites where other objects touched down in West Virginia, Pennsylvania, and Ohio—reported comparatively as operationally sound—seemingly in search of the 4 more obviously damaged and downed objects! ET Search and rescue, perhaps? Oh, and reader, I forgot to mention one thing... all of the aforementioned UFO sightings, crashes, and landings actually happened on the same day that the "Flatwoods Monster" incident occurred in Braxton County, West Virginia. ...See, the damaged flaming Flatwoods craft went down on the Fisher Farm that night amidst this flap of sightings as well as three other damaged craft, which were exploding, had pieces falling from them, engulfed in flames and making repeated crash landings throughout the country! This was a night of unsurpassed strangeness! Nonetheless, September 12, 1952 was also "DEFENSE DAY" in this country. You see reader, only six weeks prior to these sightings plaguing this country, the USAF Senior Public Information Officer, Moncel Monts (as mentioned in the previous "Forgotten War" article) had stated, "The jet pilots are, and have been under orders to investigate unidentified objects and to shoot them down if they can't talk them down." ...But wait, there is another not well-known incident also occurring that dreadful night amidst this flap of September 12, 1952 and its numerous UFO sightings. This incident—another very well covered-up occurrence involving a USAF F-94 Starfire jet fighter—details that same jet vanishing into thin air while being tracked by several military radars! Documented, the 2-man crew of this Air Force jet was actually in voice communication with TWO major Air Force bases... when it simply disappeared for no apparent reason after allegedly flaming-out! Now, for the record, the last approximate location of the jet was actually known, and one of the Air Force radars tracking the jet was one of the biggest and best that the Air Force had at that time! It was nicknamed, "HOMER." Despite a massive "air sea rescue" operation, which went "Immediately" into motion after the Starfire jet vanished and covered "over 46,000 square miles"—according to the Air Force—the plane was never found. Unexplainably, the pilots failed to eject from their aircraft and additionally, not one piece of wreckage of the jet was ever found. To this day—and along with their jet—the two airmen, pilot 2nd Lt. John A. Jones, Jr. of Florida and Radar Operator 2nd Lt. John DelCurto of Oregon... ...are still MISSING. Feschino spent well over a decade and countless hours researching this incident. He obtained official Air Force documents, the Aircraft Accident Report, news paper articles, talked to the brothers of the two missing pilots and also obtained the Jones' personal documents from the Air Force as well. After sifting and sorting through mountains of what would prove to be a convoluted paper morass, Feschino found layers upon layers—upon layers—of covered-up evidence, countless lies and obfuscations, edited reports, fabricated information bits, and a bloated conspiracy to dispose of the truth regarding this incident! He explains all this in explicit detail in his books. ...And yes, Feschino believes the incident was directly related to the "Shoot them down" orders, issued against flying saucers by the United States Air Force, remember. That Harry Truman had to have ordered all this puts another fine point on the tragedy. Consider reader, the summer of 1952 hosted the biggest flap of UFO close encounters in United States history! Fresh on the heels of this are orders to the Military to shoot those UFOs down! Jones and DelCurto go missing in their state of the art all-weather Starfire Jet on a night with over 20 hours of sustained UFO activity over a plethora of states. Connecting these dots is not remotely unreasonable and no stretch at all! Feschino is quoted as saying, "Whoever concocted the explanations given about the 'Flatwoods Monster' incident, probably wrote the script for the Jones and DelCurto story, too." Where do aircraft accident documents and files have to go on the night of 21 hours plus of sustained UFO close encounters and where other aircraft are logged in as disappearing without a trace? Stanton Friedman writes, "Surely, what has been found so far is just the tip of the iceberg of attempted military intercepts of UFOs and intercepts of our planes by UFOs." Friedman adds, "Frank Feschino, Jr. has done an incredible job of collecting, arranging and chronicling data about the UFO events that took place during the summer of 1952...Most importantly, Frank's persistence in researching the overwhelming amount of mysterious fighter jet accidents that occurred in 1952 and through the 1950s is very revealing...if not startling." Fine point, reader, on that! ADAAD-4 56 345. 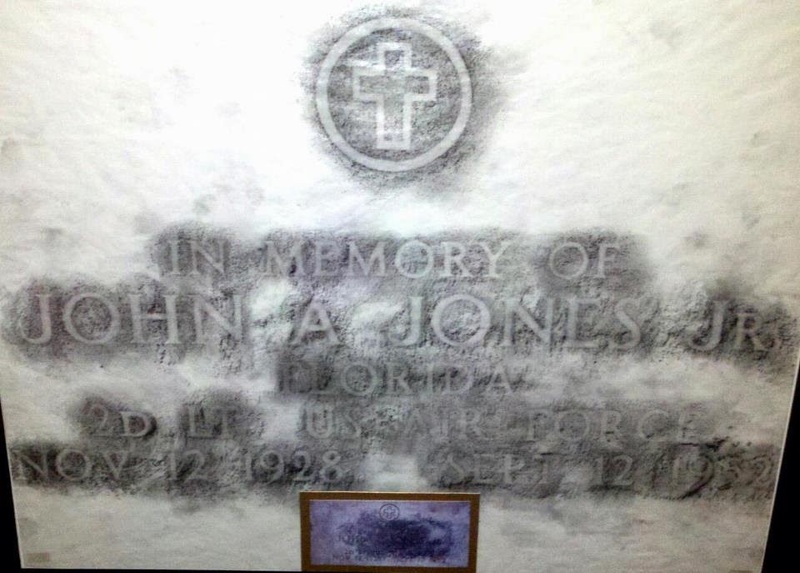 It is with deep regret that I officially inform you that on 22 October 1952, the Chief of Staff, Headquarters United States Air Force notified this command that your brother John A. Jones, Jr. was declared dead. The body was not recovered, however after the extensive search by the Air Force it was determined that conclusive evidence existed to warrant this action. Please accept my sincere sympathy in your bereavement. The extreme irony? Later on the Air Force and its parent Nation would find it convenient to pretend these two brave officers did not even exist! Less than 2 weeks after Jones and DelCurto vanished with their jet, a CIA memorandum dated September 24, 1952 was written on the UFO subject. It read, "SUBJECT: FLYING SAUCERS." This memo was sent from "H. Marshall Chadwell—Asst. director of Scientific Intelligence" to "Walter Bedell Smith—Deputy Director of Intelligence." In part, this revealing memo stated, "A worldwide reporting system has been instituted and major Air Force bases have been ordered to make interceptions of unidentified flying objects." Then, in December of 1952, TRUE Magazine printed an article written by pioneer UFO researcher, Major Donald Keyhoe, USMC retired. Keyhoe made the following statements in "What Radar Tells About Flying Saucers," and wrote, "More than 300 times, Air Force interceptor planes have chased mysterious lights and unidentified objects revealed on radarscopes." He also stated, "Week after week, jet fighters are 'scrambled' at points around the country for 'saucer chases.'" Keyhoe then adds, "Unless an object attacks our planes, or is a threat to this country, the decision is left up to our pilots." In his closing, Keyhoe stated the following. "'Even if they weren't hostile' another officer told me, 'barging in too close might scare them into attacking.'" Many years later, in 2005, Stanton Friedman stated, "So much for the notion that UFOs are not a threat to National Security. In other words, the notion that UFOs demolishing or disintegrating planes doesn't seem strange, at all—if our planes were attacking them." What, who, where, what, and WHY, reader? Where one follows the evidentiary path that path can become highly strange indeed. On Memorial Day of any year we remember the countless brave Americans who died for their country in war. Memorial Day, originally called "Decoration Day," was borne out of the Civil War on a desire to honor our fallen heroes. This federal holiday commemorates the many men and women who died while serving in the United States Armed Forces and remembers their sacrifice. Memorial Day is celebrated on the last Monday in May at Arlington National Cemetery with a ceremony and a small American flag placed on each grave. Traditionally, a wreath is placed at the site of the Tomb of the Unknown Soldier by the President or Vice President of the United States. Since the Civil War, this country has been involved in many conflicts including the Spanish-American War, two world wars, the Korean War, the Vietnam War and the plethora of bloody wars in the Mideast. War persists today, of course, as these keys are tapped. Our American history books and teachers inform us assiduously regarding these many wars, most of which occurred around the world since the first "Decoration Day." One war is decidedly forgotten and not even mentioned. As a Nation we patently fail to "even mention" a war that existed right here over the United States of America. That war, an undeclared war—a war true as unbelievable as that does sound—was waged by the United States government against UFOs in the late 1940's and early 1950's. This writer intimates no apology remembering that J. B. S. Haldane informs us that the existential is stranger than we can imagine! I'm a former Master Army Aviator and a Veteran of Air Combat. I have some small appreciation of air war, battles and the conflict conducted within it. Let me attempt to explain what occurred over the United States during that era incorporating the infamous Summer Of Saucers more than 60 years ago. The article continued, "Lt. Col. Moncel Monts, Information Officer, stated: 'The jet pilots are, and have been under orders to investigate unidentified objects and to shoot them down if they can't talk them down." The article further informed, "In Air Force parlance, this means that if a 'flying saucer' refuses to land—jet pilots are authorized to shoot them to Earth if they can get close enough to do so." The Charleston Gazette reported the following on July 29, 1952. Its headline read, "Pilots Ordered to Shoot Down 'Saucers' in Range"! It said in part, "WASHINGTON, July 28 - (INS) - The Air Force disclosed today that jet pilots are under orders to maintain a nationwide 24-hour 'alert' against 'flying saucers' and to shoot them down if possible...jet pilots are under standing orders to pursue all unidentified flying objects, especially on the eastern seaboard and if necessary, force them to land. The alert is applicable to flying saucers." How, reader, is this not a prosecuted air war against a perceived ET? Additionally, on July 29, 1952, the Fall River News newspaper of Massachusetts reported, "Jets Told to Shoot Down Flying Discs," and continued, "Several pilots according to the Air Force have tried to shoot down the mysterious discs, but the 'steady bright lights' in the sky have out-flown the pilots." Indeed, this statement clearly shows that the objects had indeed refused to land, which would prompt our pilots to shoot down UFOs as ordered. Attempts were logically made, then, by Air Force pilots! The very next day, the Louisville Courier-Journal reported, "Radar Spots 'Saucers' Over Washington Again." In reference to the well-known July 29 saucer press conference held at the Pentagon, the article stated, "Major Gen. Roger Ramey, Deputy Chief of the Air Force Staff for Operations, told the news conference that interceptor planes have raced aloft several hundred times as a result of reported sightings of unidentified objects. He said that was just standard procedure." The reader will remember that most of these confrontations between planes and UFOs are well-known and many are also recorded as "Unknowns" in Project Blue Book, the USAF initiative in charge of the UFO project. This leads us to a not well known statement made by Captain Edward J. Ruppelt, the head of Project Blue Book in 1952. In his 1956 text, The Report on Unidentified Flying Objects, and commenting on the deaths of military aviators chasing UFOs, legitimate or no, Ruppelt states, "Other assorted historians point out that normally the 'UFOs' are peaceful, and [fighter pilots] Gorman and Mantell just got too inquisitive, 'they just weren't ready to be observed closely.' If the Air Force hadn't slapped down the security lid these writers might not have reached this conclusion. There have been other and more lurid 'duels of death.'" Wait, what? Here, Captain Ruppelt clearly, if stealthily, writes about the Air Force cover-up of the "duels of death" occurring between American fighter pilots and UFOs! What does "Lurid Duels Of Death" refer to, otherwise? 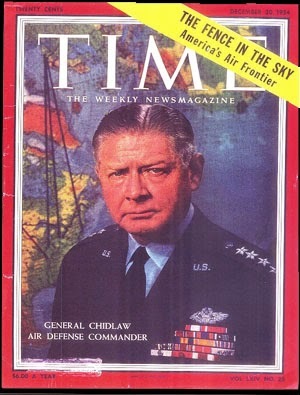 Additionally, in February of 1953, Robert Gardner, a California investigator and writer, conducted an interview with General Chidlaw, head of the Air Defense Command about National Security points of the Eastern ADC. During that 30 minute interview, Gardner recorded the following statement made by General Chidlaw, "We have stacks of reports about flying saucers. We take them seriously when you consider we have lost many men and planes trying to intercept them." Yes reader, there was an undeclared war between Our American fighter pilots and UFOs! These seem to have led to many pilot deaths, deaths not recorded in our history books or told to us by our mainstream educators! 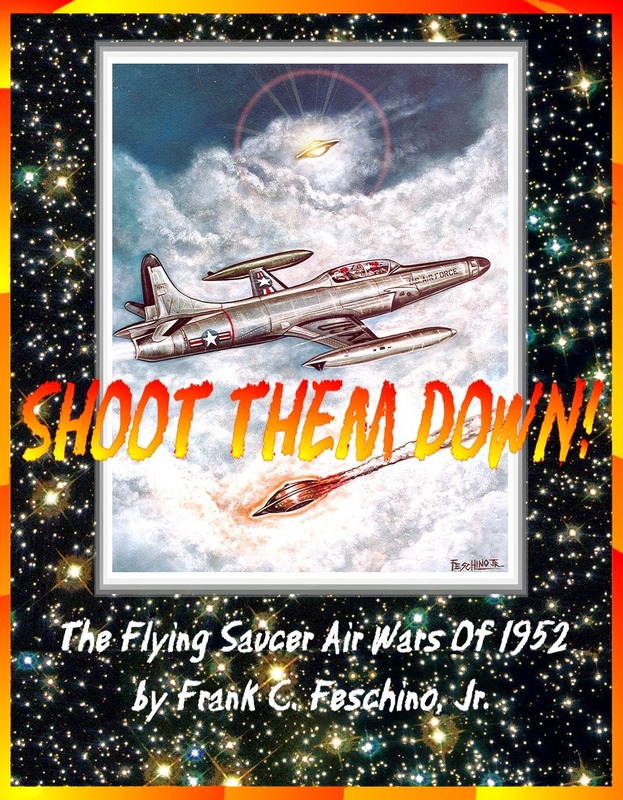 Author and researcher Frank Feschino, Jr. writes exhaustively about the history of this tremendous cover-up in his book, Shoot Them Down—The Flying Saucer Air Wars of 1952." Additionally, the history of these incredible events can also be seen in Feschino's documentary short, "The Braxton County Monster/Flatwoods Monster: book by Feschino" posted on You Tube. In closing on this most recent Memorial day remembrance, I recall the many fighter airmen who seem to have perished during intercept attempts against UFOs throughout the years and pay my profoundly moved respects to them... Some of us remember, while most of us simply choose to forget. 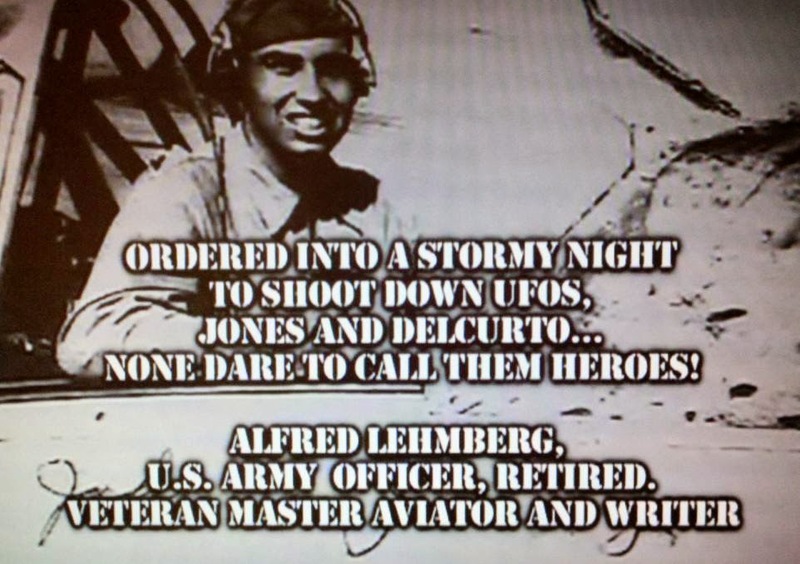 I choose to remember it exactly as Feschino has dedicated in his book, to those impossible intrepid and exceedingly brave American fighter pilots who scrambled into angry skies after UFOs to... "shoot them down"... and never returned home. Frank C. Feschino's recent book, Shoot Them Down! The Flying Saucer Air Wars Of 1952 - based largely on official documentation - makes for disturbing reading. Also, the numerous unexplained crashes and disappearances worldwide in the 1940s (described in Need to Know) reinforce my conviction that, worldwide, we have lost probably thousands of aircraft and pilots, in mysterious circumstances, over the years.